I can hardly believe that today marks 17 years since the 9/11 terror attacks. Give your loved ones an extra hug today. It seems that we all know someone who experienced immense tragedy because of this horrific act of violence. May we continue to believe in the prevailing power of the human spirit (and spread kindness, always). There are fewer things I love more than eating a sandwich for lunch. They're delicious and nostalgic. They remind me of middle school lunchboxes, weekend playdates, camping, and my early teenage years. Growing up, we'd either have PB&J, leftover BBQ chicken and cheese, or my mom's tuna salad — all on whole wheat bread or sliced sourdough. Crust, optional. Fast forward 20 years, and sandwiches are still a staple. They're simply an elevated (and more creative) version of my childhood eats. Enter: quick pickled veggies. A few weeks ago, I tried my hand at pickling red onions. It’s easy! I promise. Plus, it’s a great way to use up any onions that are starting to go south. 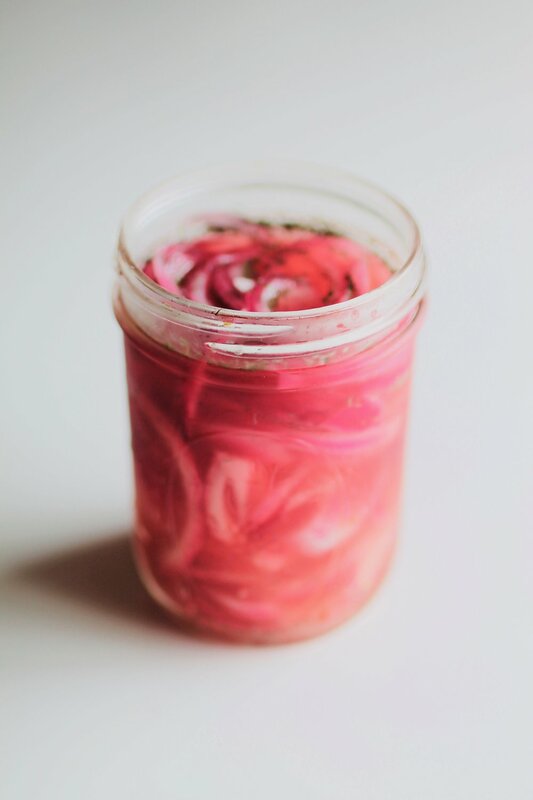 Today, I'm bringing you garlic and dill pickled red onions. While deliciously tangy in a sandwich, they're quite versatile. You can add them to a falafel-stuffed pita, atop a buddha bowl (grain + veggie + protein + sauce), layered on tacos, plated with hors d'oeuvres, or even served as an accompaniment with Indian food. The sky's the limit. Tart yet sweet, crunchy and dill-icious (spare me), you'll always want a batch of these pickled red onions on hand. I’ve found that the longer they chill in the fridge, the more aromatic and flavorful the onions become. Enjoy them for up to two weeks! P.S. Don’t care for onions? Use the same process to pickle carrot ribbons, thinly sliced radishes, chopped cucumbers, or green beans. 1. Combine water, apple cider vinegar, maple syrup, garlic, and sea salt in a small saucepan over medium-high heat. Bring to a boil for 2-3 minutes. 2. In a 12-oz mason jar (or any other clean, heatproof jar), layer the raw onion and dried dill. 3. Pour vinegar mixture over onion and dill. Cool to room temp. 4. Place the lid on your mason jar, and put the mixture in your fridge for at least one hour. They’ll stay fresh for up to two weeks.